There are a few options available for replacing missing teeth, such as dental bridges and removable partial dentures. Some folks opt to do nothing, altogether. But dental implants deliver a more benefits when compared with traditional options. Consider just a few of the biggest advantages. It’s a sad thing if you have to hold back from laughing or smiling because you hate your smile. An implant would nicely fill in the gap and bring back your confidence. You can say goodbye to the days of getting pieces of bagel or chicken packed around the teeth on either side of a gap! You also won’t have any more painful moments of biting down into something crunchy like nuts or tortilla chips, stabbing the gums in the empty space – ouch! Implants will help you eat all the foods you love without worrying about a removable denture moving around. Did you know that implants require the same care as natural teeth? You can keep your implant healthy for life with simple brushing and flossing. There’s no need to do anything more complicated. Save the shape of your smile. An implant is more than what you see in the mirror. Implants are actually metal screws that support a false tooth. The implant itself acts just like a root and stimulates the jaw bone to fuse it in place, preventing collapsed gums in your smile. 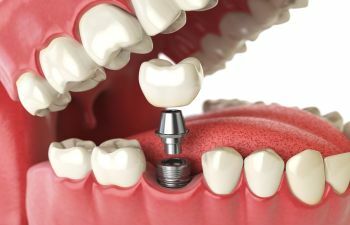 Empty spaces allow teeth to drift out of place, so an implant makes the perfect placeholder to keep that from happening. Want to know more about dental implants in Columbia? Contact Columbia Dental Center for a consultation.